I love anything miniature, but I don’t have the time or patience to make 48 little anything. And a cup of yogurt with graham crackers mixed in a mug does *not* satisfy my craving. I need the real thing sometimes–no substitutes or no-bake nonsense–but I’d rather a full-size cheesecake not sit in my fridge and taunt me for two weeks. It took some finagling and fraction work, but I finally got it perfect–just one serving of a homemade, New York-style cheesecake. Enjoy! 1. Heat oven to 325 degrees F. Lightly grease 4 1/2-inch springform pan. 2. Crush graham cracker into crumbs. In a small bowl, mix crumbs with 1 tablespoon sugar and all of the butter. Press onto bottom of pan. 3. With a small whisk or hand-held blender, whip cream cheese until smooth, no lumps. Add remaining 2 tablespoons sugar, sour cream, and vanilla, and mix again until smooth. Fold egg in and just mix to combine; avoid over-mixing once you’ve added the egg or your top will crack. Pour batter over crust. 4. Bake 30 to 35 minutes until center is just starting to set. It should be the lightest of browns on the outside edge and barely set in the middle. Remove from oven and run a knife around the circumference to loosen the cake from the side of the pan to keep it from cracking as it cools. Place pan on cooling rack and allow to cool to room temperature. Refrigerate cheesecake in pan for 1 to 2 hours, then remove from pan for serving. Use the same instructions as well, layering the ingredients in an ungreased cupcake liner, but bake for 20 minutes. Cool completely before refrigerating for 1 hour. Serve chilled. Thank you, thank you, thank you! This was the best treat ever! I’m drooling a ltilte bit just thinking about that pumpkin chocolate cake genius! And I love your blog just added it to my reader thanks so much for stopping by to visit me! I have been looking for recipes to make just one serving forever. I’m a college student that loves to bake but I can’t afford full batches and am sick of giving it all away. This is perfect! Do you have any more? delicious! and your photo is beautiful! nice job! My husband is the only one in our house that likes cheesecake and I want to bake for him but he feels bad with a huge cake sitting around. Now I can make him his own personal cheesecake! Hooray! hey, I would like to ask something, is there any substitute for the sour cream cuz I dont have sour cream… but I have cream. You could probably replace the sour cream with plain greek yogurt. Hi! What a great recipe for an individual serving! My son was disappointed because I didn’t make a cheesecake for his birthday (hadn’t realized he wanted one) so I whipped up one of these individual servings he can take for lunch, and we’ll have to cake I made after dinner. He’ll be thrilled. Just one question: wasn’t sure about the sugar in the mini- is it half tsp for the crust and two for the cheesecake? That’s what I did. I won’t know how it turns out until he reports back but I so excited I had to comment. Also, I used almond flour instead of graham cracker crumbs for the crust so it is gluten free. Thanks for the recipe! I *love* the gluten free addition! I will have to remember that! Thank you! hi.. your recipe is perfect. i still have few doubts.. can i substitute the egg with corn starch or hung curd? and shall i use whipping cream instead of sour cream. 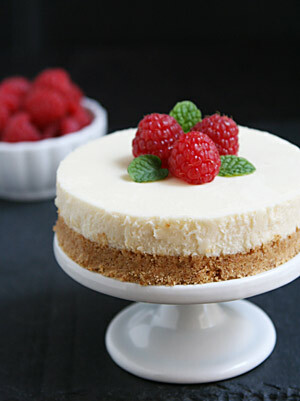 Cheesecake is generally very forgiving, so you can substitute both hung curd and whipping cream. Since cheesecake is so moist to begin with it the only difference will likely be that it will be slightly sweeter in taste. Let me know how it turns out! I was able to find gluten-free graham “style” cracker crumbs. Very happy. I love the single-serving recipe, as most recipes for this size plan make 2 or 4 of them. Thank you! Oh this sounds mouth watering. Thank you for sharing this recipe. Just made this and it was amazing. Just like one from a café. Thank you! This looks so good! By egg substitute, do you mean we can use Ener-g egg replacer? Or is it a different sort of egg substitute? Thanks! I’ve never used Ener-g, but I bet it would work. If you try it, let me know how it turns out!